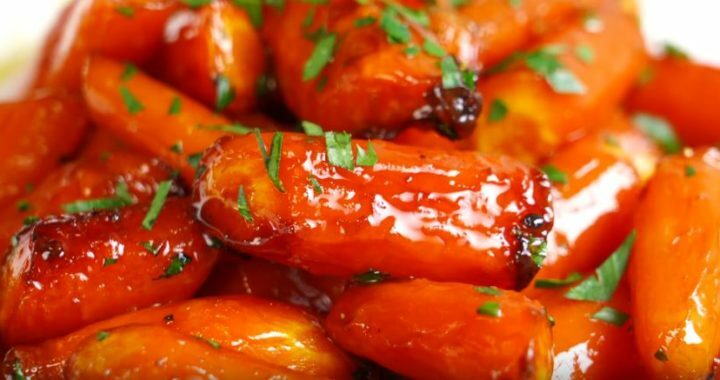 An easy but delicious stovetop glazed carrot, that you must try. So, for this I’m using about five large carrots. you can cut your carrots in any shape or size that you want, just make sure they are mostly the same size, that way it can make the cooking easier. 1). Put your carrots in pot with water in, and set the stove om medium-high and allow them to cook for about 5min, or until they are nice and tender. IMPORTANT: Don’t cook them until soft! just 5-6mins it’s enough, that way you’ll be able to continue cooking them with the brown sugar and butter. 2). Now, once they’re nice and tender, set the carrot pot aside and let the stove at the medium-high. Put a pan on it with some ginger and butter, and allow them a few minutes to melt together. 3). Now, go ahead and add the brown sugar and salt and mix it with the ginger and butter. 4). Drain the water out of the carrots, that’s will allow them to take the flavor of the ginger and butter. 5). Now, go ahead and add the carrots onto the ginger and butter pan, and let them look until nice and tender making sure that juicy mixture of butter and ginger gets into the carrots, and then let it simmer for around 30 seconds to a minute. Then, go ahead and turn off the stove and add a little bit of chopped parsley or coriander.